What we now call Public Television (PTV) began in the early 1950s as "educational television." In 1967, the Carnegie Commission of Educational Television released a landmark report recommending that public funds be expanded to guarantee a truly national system of what it called "public television." To avoid politicizing that system, Carnegie further recommended the establishment of a "Corporation for Public Broadcasting" to administer the funds and buffer political pressures. 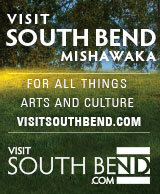 Events were also moving forward in Michiana. Community leaders were well aware of the positive effect that educational television was having in other parts of the country. Jerry Hammes and Notre Dame's Dr. John W. Meany were among the first community leaders to take up the cause. WNIT's other key founders included Michael Carmichael, Ernestine (Carmichael) Raclin, Jane Warner, Dar Wiekamp, Arthur J. Decio, and Rev. Edmund P. Joyce, CSC. The seal of the State of Indiana was affixed to the Articles of Incorporation for the Michiana Public Broadcasting Corporation a mere seven months after the Public Broadcasting Act of 1967 was signed and on April 26, 1972, the FCC granted the construction and operating permit to the Michiana Public Broadcasting Corporation. We were assigned the call letters WNIT ("Northern Indiana Television") and Channel 34 on the UHF spectrum. WNIT Public Television has long enjoyed the support of its fellow-stations in commercial television in this market. Several of the local commercial television stations donated equipment and a number of local broadcast engineers donated their time during the early years of the station's operation.It is important that WNIT is seen as belonging to all of Michiana. In its history, WNIT's offices were first in South Bend, then moved to the 100 Center in Mishawaka, and later moved to Elkhart adjacent to the studios of the newly constructed Elkhart Area Career Center. Since 2010, WNIT's offices and studios have been located in downtown South Bend. Transmitting facilities have always been located south of South Bend in an area populated by the tall towers of all area television stations. Originally located on a 500-foot tower near Ironwood and Kern Roads, WNIT moved in 1991 to a 700-foot tower on Grass Road. Then, in 2003, the station began transmitting a digital signal from a new 1000-foot tower, which is the maximum height allowed in Indiana. Coupled with a new transmitter, WNIT's coverage area was greatly expanded, providing for more people in Indiana and Michigan to view our signal. After more than two decades as partners with the Elkhart Area Career Center, WNIT was outgrowing the space available there, and was in the planning process to move to new quarters. Then, on January 11, 2009, a fire of unknown origin in WNIT's administrative offices, severely damaged the building; destroying files, records and office equipment. Fortunately, there were no injuries and WNIT's broadcast facilities and programming were unaffected. Local program production continued at the Elkhart Area Career Center but the administrative offices moved to a temporary location in downtown Elkhart. A search of potential locations was undertaken and sites were considered in Elkhart, Mishawaka, and South Bend, and a new site selected. WNIT acquired and took possession of the 30,000 square-foot former WSBT-TV building, with the assistance of an in-kind donation by WSBT's owner, Schurz Communications. In April, 2010, WNIT moved to the "Center for Public Media" in South Bend. The new Center for Public Media has allowed WNIT to greatly expand its service to our community now and in the future.